Search below to find answers to the most frequently asked potato questions. From nutrition, to storage to preparation, you'll find the answers you need to become a potato expert. Learn the secrets to cooking the perfect potato - mashed, baked, fried, and more. Is it safe to eat the skins? Absolutely! In fact, we recommend it. The skin of the potato contains the majority of the potato’s fiber, and many of the nutrients are located close to the skin. Wash the potato thoroughly, cut away green discoloration and/or sprouts and enjoy your potato with the skin on. Is it true that all the nutrition is in the skins? NO! It’s all those delicious toppings we use that add calories and fat. The potato contains zero fat and a 5.3-ounce potato is only 100 calories. Check out the recipe section of the Potato Nutrition Handbook for some healthy low-fat recipy ideas. Baking a potato is the best way to prepare it, as baking-or microwaving-a potato causes the lowest amount of nutrients to be lost. The next-healthiest way to cook a potato is through steaming, which causes less nutrient loss than boiling. No, potatoes are naturally gluten-free and can be used as substitutes to some gluten-based products in recipies such as pizza crust, lasagna, nachos and more. What size of potatoes should I buy? That depends on what you are preparing. Smaller potatoes are ideal for salads, while medium potatoes are better for baking and large potatoes are good for mashed or all-in-one meals. What is the best variety of potatoes for…Baking, mashing, boiling, frying…. The potato is very versatile, so you can use any type for most any recipe. 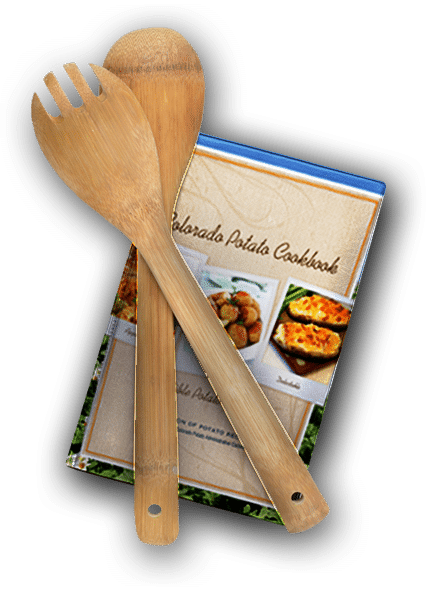 See our page on San Luis Valley Varieties for all the delicious varieties of Colorado potatoes! Do purple potatoes still taste like potatoes? Depending on the variety, purple potatoes can be opaque or marbled. They are generally dry, starchy, earthy and slightly nutty in flavor. Generally harvested young, purple varieties of potatoes yield small tubers, and are excellent for salads and boiled or roasted side dishes. What is the difference between No. 1 and No. 2 Potatoes? No. 1 potatoes are typically better shaped with less defects than No. 2’s. No. 2 potatoes bake and taste the same but may have pointed ends, more bruising, etc. Restaurant operators use No. 2 potatoes when the final appearance does not have to be as attractive a potato shape (for example for mashed, hash browns or French fries). When does the potato “planting” and “harvesting” season begin and end? Planting season typically begins in mid-April through May. Harvest season begins the beginning of September and goes through mid-October. How do potatoes stay fresh all year long? With modern technology, potatoes can be stored in storage facilities that hold a specific temperature and flow of air, keeping the potatoes fresh year-round. Is there anything harmful in eating potatoes raw? You can get away with munching on raw potatoes, but it isn’t great for your health. According to Utah State University, raw potatoes — particularly green ones — can have a high concentration of a dangerous toxin known as solanine. Raw potatoes also contain anti-nutrients. Though you can remove most of the anti-nutrients by peeling the potatoes, some still remain in the flesh. In addition, the uncooked starch in potatoes can result in digestive problems, gas and bloating. For the most benefit and the least risk from your potatoes, bake, steam, saute or otherwise cook them. Can a pressure cooker be used to cook Potatoes? A pressure cooker is ideal for preparing flavorful and healthful foods in record time with little or no fat. Because foods are cooked under pressure, up to 50% more vitamins and minerals are retained. Because steam pressure breaks down the fibers in food in a very short time, foods are succulent, with an intense mingling of flavors. Why do my potatoes sometimes turn black after I peel them? Once potatoes are peeled, they will darken if not cooked immediately. This is due to a chemical reaction between carbohydrates in the potatoes and oxygen in the air. Preventing the darkening begins with storing the potatoes correctly at home, and handling them quickly after peeling and before cooking. Can I cook potatoes in the microwave? Yes, many microwaves have moisture sensors inside so that all you need to do is press the button that says ‘potato’ and wait. If your microwave doesn’t have a potato button, a general rule is that one 7-to-8 ounce potato takes about 7 minutes to cook. 2 will take about 11 minutes. Puncture potatoes with about four holes before microwaving to avoid risk of explosion. Where is the best place to store potatoes? Store your potatoes in a cool, dark, well ventilated area. Do not store in an unventilated plastic bag or container. Protect from direct light. Temperatures lower than 50 degrees, such as in the refrigerator, cause a potato’s starch to convert to sugar, resulting in a sweet taste and discoloration when cooked. Should I wash my potatoes before storing? No, we don’t recommend washing before storage. Since dampness can cause decay, it is best not to wash spuds before storing. Once mashed, they can be frozen, but will typically oxidize or turn gray in a matter of days. To help prevent this, add a small amount (tablespoon) of white vinegar or concentrated lemon juice to the mixture once cooked. What causes the green coloring on the skin? Is it safe? The green on the skin of a potato is the build-up of a chemical called Solanine. It is a natural reaction to the potato being exposed to too much light. Solanine produces a bitter taste, and if eaten in large quantities can cause illness. This is unlikely, however, because of the bitter taste. If there is slight greening, cut away the green portions of the potato skin before cooking and eating. How long do potatoes last after purchase? If stored at 45-48° Fahrenheit with 95% humidity the potatoes will last quite some time, potentially months; however, most people are not able store them under those conditions. When stored in the dark cool location and you should be able to have them stay fresh for up to four weeks. Sprouts are a sign that the potato is trying to grow. Cut the sprouts away before cooking or eating the potato. To reduce sprouting, store potatoes in a cool, dry, dark location. What causes some potatoes to have a hollow center and black crust? What is this? This is called “Hollow Heart,” which is caused by a sudden change in the growth rate of the potato. This can happen if the potato plant suffers from lack of water during the growing season then receives too much water all at once. Irrigation and the constant diligence of farmers limit this from happening. What variety of potato is best for baking? Traditionally, Russet potatoes have been a favorite. However, any variety can be baked. How do you cook the perfect baked potato? There’s no need to wrap your potato in foil. Simply pierce a few holes in the potato with a fork and bake a 400° Fahrenheit for 45 minutes, or until potato is tender. What's the best way to open a baked potato? Never use a knife for opening a baked potato; it flattens the surface and alters the normal fluffy texture of a baked potato. Instead, pierce the potato with a fork, once lengthwise and crosswise. Press the potato at both ends and it will “blossom”. How do you know when your baked potato is done? Potatoes are ready when their internal temperature reaches 208 to 211° Fahrenheit. A fork easily pierces a potato when it’s done. If the potato is hard, bake a little longer. However, watch out for over-baking, or drying of the underskin will occur. What is the ideal temperature for baking a potato? We recommend baking potatoes at 400° Fahrenheit for about an hour. Smaller spuds might take a little less time, while larger baking potatoes (over 1 pound) might take a little more. How do you re-heat baked potatoes? To reheat baked potatoes, uncover and bake at 275° Fahrenheit until the internal temperature is 185° Fahrenheit. How do you cook a potato in a crockpot? Prick the potatoes with a fork several times, then rub potatoes with olive oil, sprinkle with salt, and wrap tightly in foil. Place the potatoes into a slow cooker, cover, and cook on High for 4 1/2 to 5 hours, or on Low for 7 1/2 to 8 hours, until tender. What variety of potato is best for mashing? Traditionally Russet or Red potatoes have been a favorite. However, any variety can be mashed. How do you cook the perfect mashed potatoes? Cook with their skins, then rinse and peel. Cook potatoes until fork tender. * Heat milk until scalding. Drain potatoes; peel if necessary. Place in mixer. Pour heated milk into mixer with potatoes. Whip on low setting until smooth, about 1-2 minutes. Add butter or margarine and salt. Whip on high setting for 3-4 minutes. Can you prepare mashed potatoes ahead of time? Don’t over mix the potatoes. The starch cells break down easily and the potatoes will become gummy. Be sure to add in the liquids hot (cream and butter) and again, just fold in. Cool to room temp and refrigerate for next day service. Cover with a clear wrap (make sure they are not warm when you do this step or the potatoes will turn out soggy) so no excess air is exposed to the mixture. Reheat and if necessary, add more hot liquid once fully cooked. How can you reheat mashed potatoes? Reheating with the slow cooker works best when the mashed potatoes have been thawed in the refrigerator. Add the potatoes to the slow cooker and heat on low for 2 to 4 hours. For faster results, add the potatoes to a covered dish and heat them in the microwave at half-power for five minutes, stirring occasionally. What potato variety is best for potato salad? The Russet variety has high solids (starch to water ratio) and tends to be drier when cooked. How can I ensure food safety when making potato salad? Use prepared mayonnaise instead of making it from scratch, as the egg ingredient has been pasteurized and the additional lemon or white vinegar is acidic and has quite a bit of salt. All these ingredients help when paired with a low acid food such as potatoes. Raw eggs are a possible safety hazard when left out, and can develop salmonella bacteria when left at room temperature. If adding sliced eggs, make sure they are hard boiled and therefore fully cooked. Temperature guidelines are important in warm weather, but also remember to start with clean utensils, bowls and ingredients, with no cross contamination, especially from the cutting board when chopping the potatoes. Once the salad is finished being prepared, chill in the refrigerator for several hours, four is ideal. Pre-chill the cooler for the potato salad with cold water or ice before dumping and adding in the finished salad. Bring along a larger bowl and make a nest of ice to place the bowl of potato salad into, keep it covered until service and remove once the buffet line has gone through (you can always place it out later for seconds). Also, it is important to keep the potato salad out of direct sunlight. How do you prepare the perfect potato salad? First, cut the potatoes into large chunks (1 to 1 ½ inches square) and they will cook faster in boiling water without breaking down. When you cook the potato whole it often means that the outside will be mushy while the center is not quite done. Start with cold water and toss in the potatoes. Check them at 15 minutes. If you stab a piece with a knife and it can be squished or mushed the potato is done. Hard spots mean continue to cook until “fork tender”. Second, it’s fine to leave the skin on. Many of the potatoes nutrients are in the skin or just under that surface, so not peeling may actually help. Why is my potato salad watery? It could be the type of potato used. A waxy or moist potato tends to stay that way when cooked. The Russet variety has high solids (starch to water ratio) and tends to be drier when cooked. It is recommended cutting the potato into chunks before boiling, rather than boiling whole. This way, each chunk cooks faster than a denser, whole potato and cooks evenly so the outside does not turn to mush before the inside is finished cooking. Some lighter mayonnaise based dressings or lite versions will liquefy easier than a traditional mayonnaise. It is not suggested. Mayonnaise doesn’t freeze well, and the same with celery and eggs. The potatoes will change color from the mayo, which separates. Also, from a food safety standpoint, once the dairy is mixed with the potato, it is best to consume right then or at the latest, the next day. To get rid of any excess moisture place the potatoes in a salad spinner before putting into plastic food bags for storage in the freezer. Do not place the potatoes in foil and freeze, use the plastic bags instead. Foil can discolor the potatoes. Can I leave the skins on in a potato salad? Absolutely! There is no reason the skins cannot be left on a potato when making potato salad. The skin on a potato adds a nice texture and flavor to the salad and it’s also packed with nutrients. How do you prepare the perfect fresh-cut French Fries? Cut and wash the potatoes until the water runs clear. This helps rid them of any excess starch or sugar. Lower the temps for blanching by at least 10-15 degrees and just blanch longer. Why are my French Fries sometimes dark? Did you purchase a potato that will fry? Russet, some of the yellow chipping potato varieties, etc? If it is a raw product, does the potato have high solids (starch)? Was the potato stored too cold, turning starch to sugar? Were the potatoes cut, then rinsed to remove excess starch and sugars? Were the blanched fries allowed to cool without being in a covered container? The steam released after cooking can fall back on the fries. Were the fries dry when placed into the fryer? Use a salad spinner or drain the fries over a metal grid to remove excess oil or moisture before frying. What is the temp of the fryer set at? 350° Fahrenheit is ideal. Can you deep fry fresh cut French Fries directly after cutting them? The answer is yes, many people cut the fries right into a bowl and fry them up at once. A two fry method, sometimes called blanching, just allows the potatoes to be partially cooked first and then refrigerated before the final frying. When this happens, the cells tend to glaze over once the cooked fries sit for a while. The second fry up cooks faster and doesn’t absorb as much oil. How do you blanch French Fries? You can blanch fries before frying them to make the best fresh cut French Fries. First, cut and rinse the fries to get rid of any excess starch or sugar and then store them in water with some concentrated lemon juice (1 tablespoon to one gallon of water ratio). Drain the water, and then fry until the fries have a glazed look and are a little limp. How long it takes for the fries to become limp depends on the variety of the potato and cut of the fry. Pull the fries out and place uncovered in shallow pans. Cool the fries to room temperature and then refrigerate. Put lids on the pans until you are ready for the final frying. Why should I refrigerate blanched French Fries? This technique gives the potato a chance to set-up, or rest. The cooled potato glazes over the outside surface cells and this seal creates an extra crispy fry with the finish frying cycle. How can I deal with sugar when making French Fries? Sugar is the number two enemy when making fresh cut French fries. Number one is low solids or starch. Low solids will make your fries soggy. That’s why a low solid potato, such as a waxy red, just won’t fry up properly. High sugars will mask the problems, as it can ruin a perfectly good potato with high solids by tricking you into thinking it is fully cooked. Too much sugar causes the potato to change color prematurely… but it is not fully cooked. The final color is directly related to the quantity of sugars in the tuber. Storage (before you get the potato) is important. But storage, especially in a cool refrigerator or walk in at your operation is also important. Remember this guideline… below 40° Fahrenheit, the starch in the potato will start to turn to sugar. As a potato matures and sizes up, the sugars in that potato are reduced to a low level (depends on the variety). Long term storage at cooler temps raises the sugar level. Stresses in storage such as low temperature, low oxygen or physical damage all can increase sugars. How do you store French Fries after they have been cooked? In the olden days, French Fries would be left out at room temp, but it is now advised that once cooled down to room temp they immediately be refrigerated. How do you prepare Scalloped / Au Gratin potatoes? Scalloped and Au gratin potatoes are baked “en casserole” and made from peeled potatoes combined with flavored heavy cream, white or cheese sauce, or uncooked custard, then slowly baked until potatoes are extremely tender. Slice potatoes 1/8-1/16″ inch thick. If you pre-slice the potatoes, acidulate them in water with lemon juice; then dry, cover, and refrigerate to prevent browning. Layer potatoes in a buttered hotel pan and add heated cream, sauce, or custard. Shake pans to distribute ingredients evenly. Cover loosely with foil, then bake in a moderate oven (325-350°F) until tender, about one hour. Remove foil and brown as desired. For Au Gratin potatoes, top with bread crumbs, butter, and grated cheese after baking, then brown. The potatoes should be tender but hold their shape when portioned, and the sauce should be smooth. For most attractive portioning, hold potatoes for 10 minutes before serving. En casserole dishes hold longer than boiled or baked potatoes. Cover dish loosely with foil and hold in a warm place about two hours. If necessary, reheat in the oven or brown lightly under a broiler. For quick scalloped potatoes, mix flour, salt, pepper, and milk, then pour over potatoes and bake for one hour. The long baking time dissipates the flour taste. For a low-fat version, mix skim milk, potatoes, garlic, salt, and pepper and simmer until potatoes are nearly cooked. Stir until thickened and pour into a pan sprayed with cooking spray. Sprinkle bread crumbs and Parmesan cheese on top. Bake at 350° Fahrenheit until brown. Can I freeze cooked Scalloped or Au Gratin Potatoes? That depends on if the potatoes are already cooked. If so, you should be fine for two-three weeks without discoloration. If they are sliced, but raw, they will turn black even with freezing.